I woke up this morning with the world unrest heavy on my heart. As we look to celebrate our great nation of America and her bought and paid for independence this July 4th, I couldn’t help but have my heart drawn to the real battle which has nothing to do with lines on a map. Yes, Satan has drawn us into battle lines of the flesh, culture wars, class wars, economic wars, resource wars and countless selfish, hoarding type behaviors however those are just distractions. The most telling physical war of them all is the physical and spiritual genocide that the Arab-Jewish war and the desires for complete occupation of Israel and destruction of the Jewish people across the globe represents; that is the physical manifestation of Spiritual Warfare. This is not just another territorial war, this is a war of biblical proportions, one that has existed for thousands of years and one that has been clearly defined and prophesied for just as long. As I reflect on the evil principalities at work at the universal level, I am drawn to reflect on that same internal battle that exists inside each of us. Born of flesh, we are brought into this world fully engaged in spiritual warfare long before we are ever aware of its existence. I have no doubt in my own life that God has always been guiding, protecting, molding and preparing me for these days that are upon us now and are to come. I couldn’t always say that, I resented my life and the people who raised me. But I see now that God allows evil to mold the character of those He has chosen for the greatest battles, but He will not let them be overcome by those battles but instead strengthened through a higher awareness and reliance upon God Himself for the victories. It takes no stretch of the imagination to realize the incredible burden each and every Christian on the planet faces as we are called to be God’s spiritual warriors against the evils of immorality, hatred, jealousy, the depravity of addictions, the lusts of materialism, careerism, egotism, the destructiveness of selfishness, entitlements and pride. The character traits of those who openly deny Christ are no different from the war that rages in the belly of us who are confident in our salvation, for our old self’s natural inclination is toward all those same behaviors and we must intentionally draw on the Spirit within, the Blood that covers, and the Word that sets free. We will never change the world if we don’t first ourselves become renewed. We can’t give away what we don’t have. We must first deal with the logs in our own eye before thinking we are strong enough or carry enough Truth in our hearts (not head) to influence an unrighteous and dying family, workplace, neighborhood, city, state, nation or world. So how do we do that, how do we protect ourselves and others from our own inner demons of flesh and the outer world of darkness and evil which is gaining momentum? 13 Therefore, take up the full armor of God, so that you will be able to resist in the evil day, and having done everything, to stand firm. 14 Stand firm therefore, having girded your loins with truth, and having put on the breastplate of righteousness, 15 and having shod your feet with the preparation of the gospel of peace; 16 in addition to all, taking up the shield of faith with which you will be able to extinguish all the flaming arrows of the evil one. 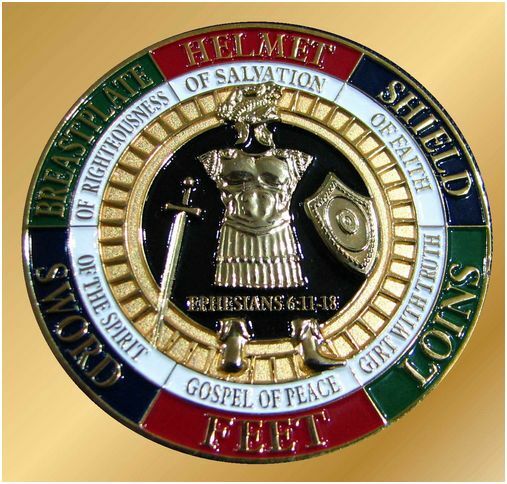 17 And take the helmet of salvation, and the sword of the Spirit, which is the word of God. Father God, the signs of Your return appear all around us. Help us this day be true to Your calling, helps us to wear Your armor alone and not reach for the comforts and protections of the Liar and Thief who comes to kill steal and destroy. We wear Your righteousness not because of who we are or what we’ve done, but solely because of who YOU are and what YOU’VE done. Thank you Jesus for standing in the gap for all mankind so that we may stand tall, walk proud and speak boldly in the name of God because You are with us, in us, on us, around us; You go before us, stand with us, and prepare the road ahead of us. Bless our politicians with the incredibly frightening awareness of their own selfish ambitions and destructive ways which draw our nation deeper toward that of Sodom and Gomorrah which will leave You God little choice but to allow our destruction and instead have them fight for justice and righteousness in Your name as our forefathers fought for which You gave us in this great nation hundreds of years ago. Help us each as individuals grow closer to You so that we may love, encourage and direct others toward their own relationship and reliance upon You. Help us to not just know, but live out the truth that it is You who saves and often times we need to just be directing traffic toward You and not trying to paste-up road signs and rule books in the path of those we influence. Thank you Father for my suffering that leads to Your glory. In Jesus’ precious name. This entry was posted in Addiction, encouragement, faith, hope, Jesus, The Cross, wake up America and tagged armor of God, Ephesians 6, faith, gospel, Holy Spirit, righteousness, salvation, truth. Bookmark the permalink.